bunglo wallpaper is here!! Choose from 8 patterns, printed with natural inks on recycled paper. You can order the exact amount by the yard, preventing unnecessary waste from buying wallpaper in the old fashion ‘rolls’. Order a sample today! Our Cosmos paper has been our biggest hit so far! 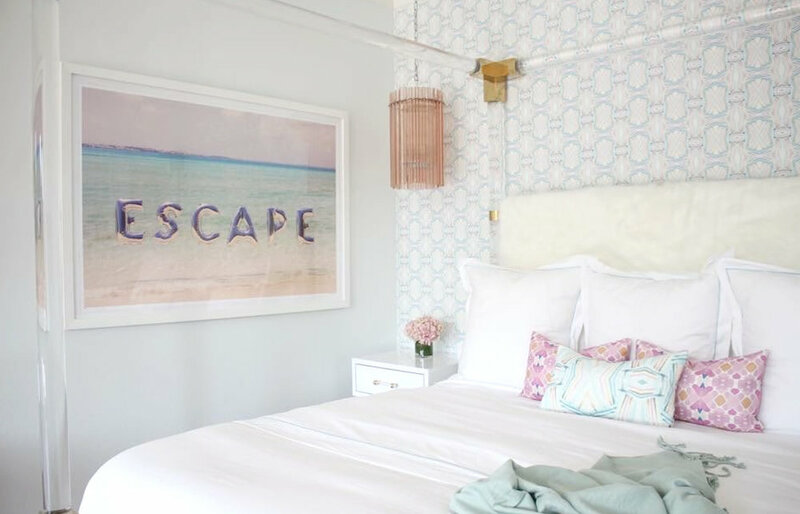 I love what Angeline did with our new wallpaper in a teen’s room in the Hamptons! Re-think pink! Use it boldly, you’d be surprised how happy you’ll feel with rosy hues filling your mind! Love moody colors? We’ve got you covered! Use a bold print for an area that’s unexpected – like a ceiling or closet! Next CANDLES, NOTEBOOKS + GIFT BOXES!